For the last year and a half, or so, I have been taking my photos with a Nikon D3200 with a Tamron 60mm F/2 Macro 1:1 lens, and have been pretty happy with most of the images. Sometimes, though, I find an interesting area that is smaller than I could shoot and enlarge to the size I really want (I have some images enlarged to 30″x40″, but they have to be pretty big to begin with). I have been dreaming of the Nikon D800 because of it’s 36 megapixels, but the reality is that it is not yet in my budget – just need a few more big prints to go to new homes to justify it. While I was at my local camera store (Camera Corner in Green Bay) drooling over the D800, the salesperson suggested trying extension tubes to allow me to get closer to the glass and thus increase the size of the photo. Finally, I have been trying it out. I can get much closer and stay in focus on some of those tiny portions of glass that have a lot going on. My full frame now is approximately 12mm by 5-6mm and there is a lot of detail that I can now get in focus. It will be interesting to see how some of these look enlarged. Here is one photo I took last night. The glass is a 6″ disc that looks a bit boring without just the right light. Plus, as I find is often the case, most of the fun stuff can’t be seen without the magnification. I’m calling this one “Eye of the Beast”. 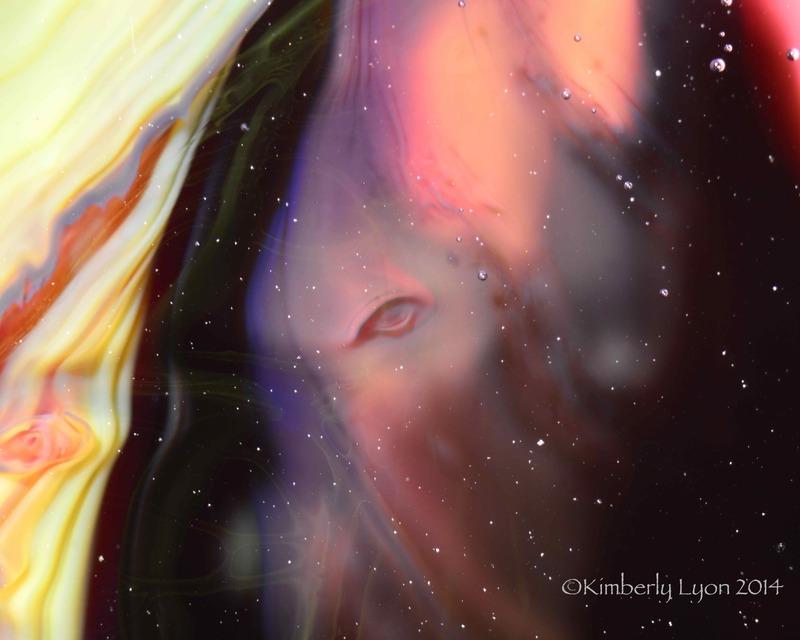 This entry was posted on May 1, 2014 by Kimberly Lyon. It was filed under abstract, art, glass, macro photography, photography and was tagged with abstract, aluminum, circles, close-up, glass, macro, macro photographs, photography, prints. Wow, great job Kim! The pics keep getting neater and more colorful all the time.